Members of the House of Representatives stand for the Pledge of Allegiance at the opening session of the 114th Congress on Capitol Hill in Washington on Tuesday. 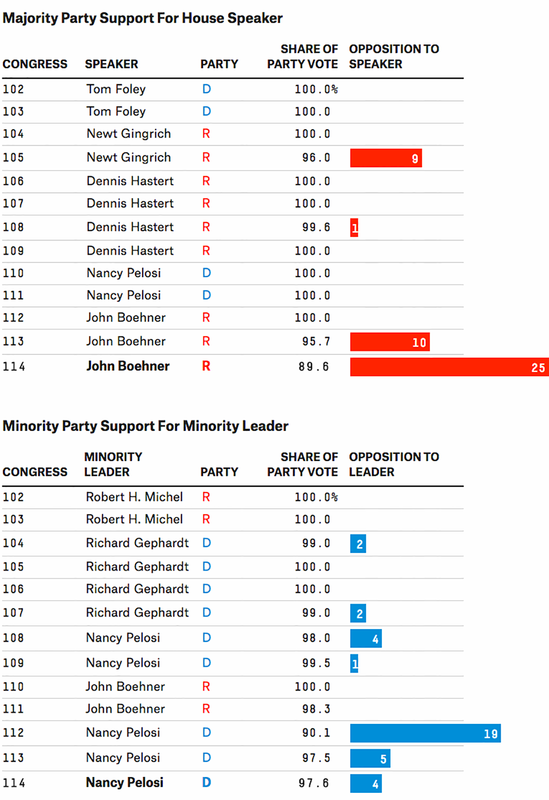 Rep. John Boehner was re-elected speaker of the House on Tuesday, but 25 Republicans did not vote for him. That means he received only 89.6 percent of votes for speaker from members of his party. This is the second speaker election in a row in which Boehner received less than 96 percent of the GOP vote from members who were present or voted for a candidate. It’s also the worst performance for any speaker within his own party since the Great Depression. The movement to voicing opposition in a public vote is probably much more of a performance art than anything else. It’s a way for members of Congress to show they haven’t gone “Washington.” With every part of a representative’s record being scrutinized in the media, members may find it worth their time to score points with supporters at home and potential donors on the web. The real election of party leaders still takes place behind closed doors. Boehner’s and Pelosi’s re-elections were all but assured before Tuesday.